Who would this programme suit best? 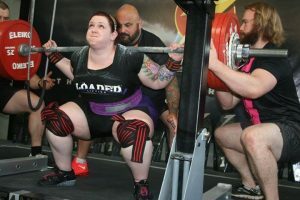 An intermediate lifter who had incredibly limited gym time who wants to get better at the power lifts in terms of strength and doesn’t want to have to think too much about what they are doing. Someone with no powerlifting meets coming up who wants to just train, progress and not have to put any thought into what they are doing. Who would this programme not really suit? 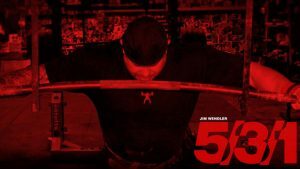 5/3/1 is one of the most popular templates on the internet if not the most popular powerlifting based programme. Thousands if not tens of thousands of intermediate lifters and even athletes have had a lot of success using the programme. 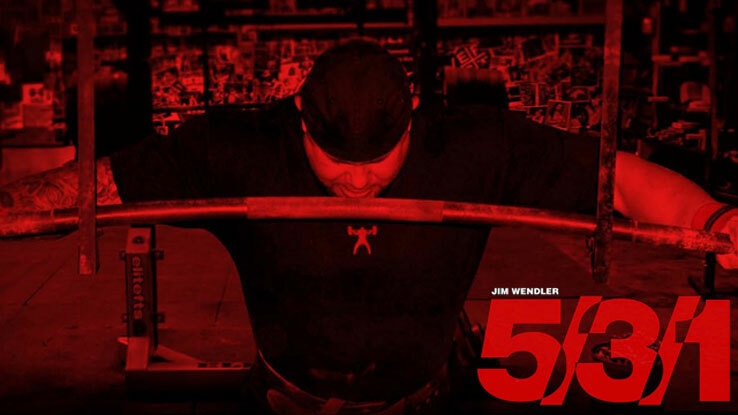 It has been so successful that Jim has produced quite a number of books and programmes of the back of 5/3/1 including 5/3/1 for football and a more powerlifting specific version of the programme 3/5/1 which is basically an amended version of the original 4-week template with heavier singles during week 1 and 3. With a volume load/deload week on weeks 2 and 4 of the programme. Micro cycle – 1 session to 1 week. Breaking the programme down into its organised training periods. 5/3/1 is designed to be a repeatable block of training so there isn’t really a longer planned period of training to discuss it is more of a 4-week template (a block of organisation designed to be used on its own or repeatedly). What we can do instead, however, is look at what 12 months/blocks of the programme would look like if a lifter managed to complete 12 blocks back to back using the suggested increments of 5-10lbs. Below you can see this trajectory plotted out for a lifter with a maximum of 190kg. 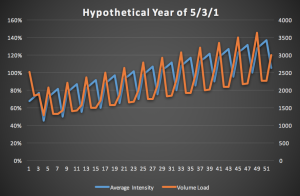 The chart follows a lifter with a starting maximum of 190 kg who then follows the advice of taking 90% of that maximum (which in effect means taking the set percentages and taking 90% of those working loads as will discuss in the micro cycle level discussion). As you can see the progress of the programme over a longer time span (4-12 months) is pretty limited for a stronger/more advanced lifter. 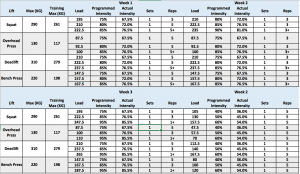 The 1+ week starts at an actual intensity of 85.5% RM and after 12 blocks of the programme on the 1+ week (week 51 of 52) the lifter will be expected to utilise 145% of their original training max for the rep out set. This is assuming they add the advised top end of 5kg (10lb) each block and manage to complete the programme. In real terms, this means they have gone from using 162.5kg for their 1st Rep out set on the programme to using 222.5kg for their rep out set on block 12. This is clearly unsustainable progress. You might argue that you could revert to 2.5kg as the increased weight but this is just delaying the inevitable and falling foul of the same assumption that the simple over load mechanism of adding weight to one 3 week loading cycle is going to work indefinitely. Which Jim does not assume is the case in the book when a lifter stalls out or plateaus on the programme they are advised to start again taking 90% of their new max and start again. This kind of programming will work very well for a lifter who is sensitive to stimulus/adapts easily so someone who is in their first 1-3 years of lifting or who is using steroids and starting a new dose this programme will be reasonably effective. We are probably looking at a realistic usable life of 4-8 months on the programme depending on the training history and age of the lifter. As the programme is only really a template or in reality, a 3-week loading cycle there hasn’t been a lot if any planning that has gone into where the programme goes in the longer term so looking at it from the Macrocycle point of view is probably not shining the best light on it. The 5/3/1 programme consists of 4 weeks of training effectively a 3-week loading phase and a one-week “deload”. The programme follows a 3-week linear programme utilising open ended sets to achieve an overload on each of the lifts. Since the programme asks the lifter to take 90% of their true max as the starting load we will look at the real percentages the programme utilises. The puzzling thing about the planning of this template is why these weren’t the original training percentages used when putting the initial cycle together or writing out the eBook or articles. This hints to the original plan being as is written and then through running the programme it was found that the loads utilised where to high for progress to be sustainable. Leading to the 90% of your actual max being bolted on Ad-Hoc. Below is the first training cycle using the prescribed reps on the programme and the adjusted training percentages. Below is the same table but included are the likely results from the open ended rep out sets based off the actual percentages programmed and the rep maxes that they predict. 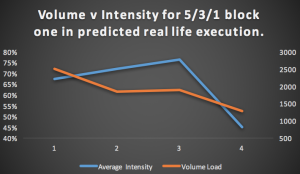 The rep out sets don’t really add much in terms of total volume load when added to the programme in our example they have added the following % more volume. This looks on the face a huge increase in the programme in terms of relative volume load (prescribed reps when compared relatively to actual volume load) however what this shows is the lack of volume in the original plan. 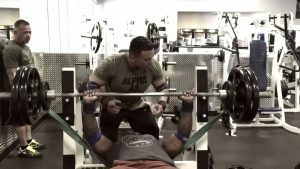 If an extra 4 reps even at what is a reasonably heavy percentage can add 30-50% more to the volume load of the week all this says is how little total volume there is in the training week. 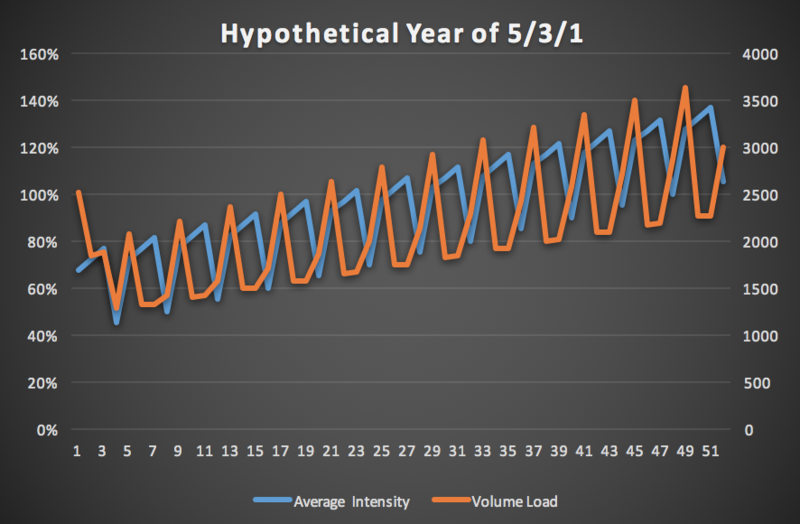 When we plot average intensity vs the volume load of the programme what we see is a typical 3-week linear plan where the programme starts with a “higher” level of volume which decays over the block and the intensity of the programme does the opposite starting at the lower end on week one and over the 3-week training phase it increases. 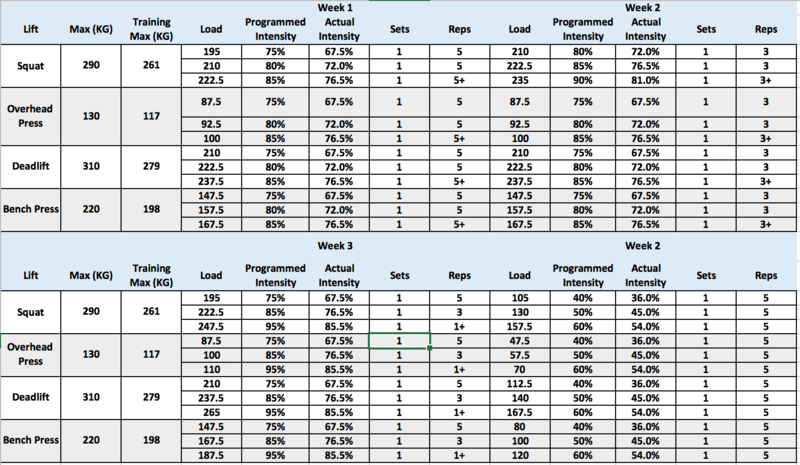 On week 4 the “deload” week consists of the lowest volume and intensity of all the mesocycle (month). 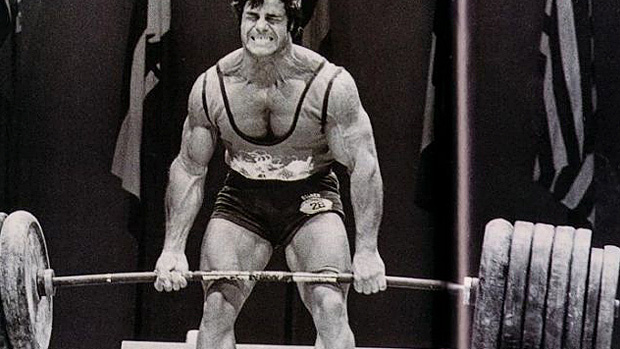 The deload is comically low in both volume and intensity and as such has been removed from a lot of novice/intermediate lifters programs. With a volume of 15 reps and average intensity of 50%, it is difficult to see the point in the week since the programme itself presents a very low workload. The deload is in actuality a lost week. 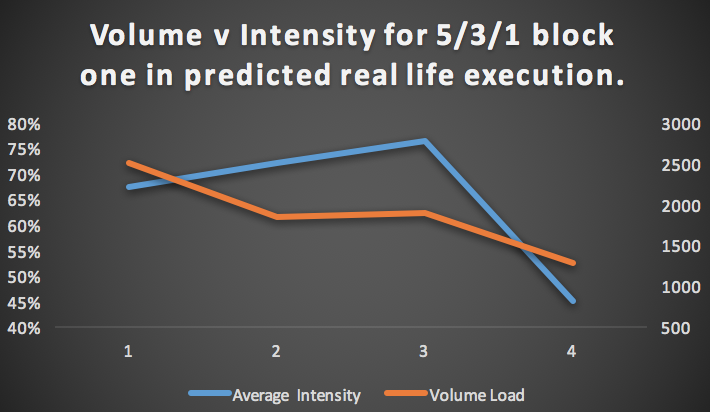 It is perfectly feasible for lifters to hit far in excess of these RM targets given the arousal in the set and the fact there is little if any proceeding volume for the lifter to be carrying any fatigue into the set. It is advised that the lifter advance their training loads by no more than 5lbs (2.5kg) for upper body and 10lbs (5kg) for lower body for any following training cycles of 5/3/1. This proposed progression not only completely disregards the performance of the lifter from the previous bock (i.e. if they far in exceeded the rep targets expected indicating they are being under cooked by the programmes percentages or they fell short of the expected results indicating they are overreached). It also does not take into account the lifters absolute strength an increase of 2.5kg for me as a 220kg bench presser represents an increase of 1.13% whereas for a novice female say with a 55kg bench max it represents a 4.5% increase in training max. Simply by using a percentage increase of say 2-2.5% of training load you could produce a relative and scalable increase for all lifters. And with some intelligence/agency (i.e. using a coach) these can be adapted to the lifter i.e. a strong lifter can be guided at a more gradual sustained pace while a beginner can be advanced more rapidly. The session structure basically follows as main lift and two accessory lifts, there are a few suggestions to follow for the assistance lifts as in terms of sets x reps with little in the way of progression suggested. No progression or regression of the assistance work. 5 sets 10 is an arbitrary sets x reps suggestion because there is no suggestion on where it should progress to over the block. 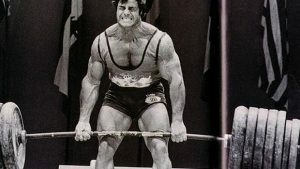 More volume of the target lift is a good idea but doing it on one day means your not taking advantage of the easy advantage splitting volume up with frequency gives to strength gains and skill learning. There are other suggested assistance “methods” such as the periodisation bible by Dave Tate or the “Trimvuitre” i.e. just 3 exercises in the session including the main exercise. Overload is ensured using the programme as it’s set out so lifters will definitely progress for a period at least. Focus on slow progression and use of volume instead of straight weight teaches good training habits and the book is good at conveying this. Glaring band aid solutions such as x your max by 90% shows the lack of planning in the programme. One trick pony utilising acute fatigue and overload provided by one off sets to achieve the overload stimulus. Lack of 90%+ lifting means carry over to top end is not catered for. “Deload” week is of such low intensity and volume to be essentially a waste of time.